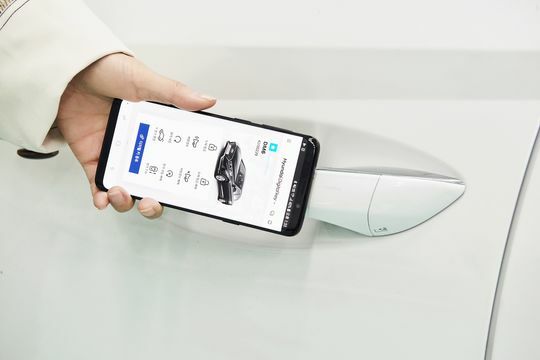 Hyundai has announced to introduce a digital key operated via smartphone to allow the drivers to unlock and start their vehicles. The new smartphone-based digital key technology would simplify the entry in the vehicle for the Hyundai users. The decision came on the back of the rising number of cases where drivers forget to leave their key inside the vehicle which has also resulted in numerous theft incidents. Therefore, as a solution, Hyundai has decided to eliminate the conventional car key. For this purpose, “Near-Field Communication (NFC)” will be used that will help in detecting if the approved smartphone is near the door of the vehicle. Note here that NFC technology requires the user to be within a range of about 4 centimeters. Once it allows the authorized entry into the vehicle, the Hyundai user can start the engine in a hassle-free way. According to Hyundai, you can place your smartphone on the wireless charging pad and press the ‘engine start-stop button’ to start the vehicle. To use this feature, users will have to download the digital key as an app in their smartphone. Each vehicle would only allow up to 4 authorized devices for unlocking. In a bid to facilitate the customers in a more advanced way of entering in their vehicle, Hyundai has joined the club of other auto manufacturers who already offer this particular feature. Apart from Hyundai, Tesla also makes use of the smartphone via Bluetooth in its Model 3. However, the use of Bluetooth technology to unlock and prepare the vehicle to start needs the driver to come within a range of nearly 30 feet of the vehicle. Hyundai is also looking to develop standardized specifications for digital car key systems along with the auto giants like BMW and Volkswagen. Moreover, this technology has additional features to facilitate its users such as automatically tuning the personal settings in accordance with a specific driver. Every authorized driver for a certain car can customize the settings including the seat positioning, mirrors adjustment, and audio controls. Once these settings are saved, Hyundai’s technology will take care of them next time you enter your car. The auto manufacturer is expected to debut smartphone-based technology in its redesigned 2020 Hyundai Sonata. After that, selected vehicles will offer this technology this year. Hyundai believes that it would reduce the growing number of theft cases where drivers forget to leave their key inside the vehicle and make it easier for car stealers to press the start button and escape. Furthermore, the company is also developing another similar technology that involves a fingerprint-scanning system to start a vehicle. We will have to wait and see when Hyundai launches smartphone-based digital key technology supported vehicles in Pakistan. Drop your valuable thoughts in the comments and stay with PakWheels for more updates on the automobile industry.